Turkeys are not known for their intellect. This is why one of the most effective tools for hunting turkeys is the turkey decoy. The latest turkey decoys are highly realistic so they easily bring the real birds into your target zone. 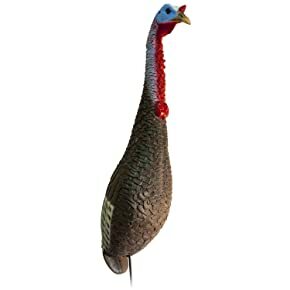 The best turkey decoy actually uses lifelike features and the latest technology that makes them highly durable so they last for years. 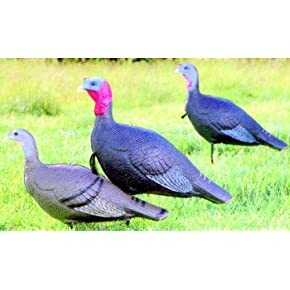 Remote-Controlled Decoys – The best turkey decoys are the realistic ones. While there are plenty of turkey decoys that could pass for real turkeys, the best ones actually move. The latest decoy technology includes remote controls that allow the hunter to get the turkey decoy to shake just like a real one. If you do use a remote-controlled turkey, the best type to get is a Jake. If you can get two decoys, get a remote-controlled Jake and a hen, too. 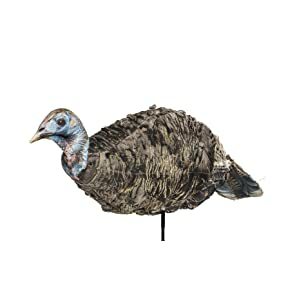 These two types of turkey decoys will draw in the big Tom turkeys, which is the type you really want to shoot. The Tom will head right for the Jake that is invading his territory allowing you to take the shot. Durability – When you invest in a turkey decoy, you want the best turkey decoys for the money. When you begin your hunt for the best decoy, look for ones made of durable rubber. These are easy to carry because they are lightweight. You will be carrying your decoys into the woods, so you want to be able to pack it up into a backpack without straining your body. 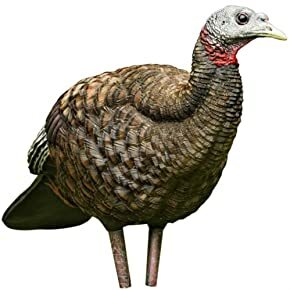 Rubber decoys are solid in their structure, so they stay in the posture that draws in the real turkeys. Many rubber models can be inflated so they look like real turkeys. The durable rubber does not puncture when attacked by the real birds. Rubber decoys do not fade over the years, too. Feather Details – Even though turkeys are not very smart, they do seem to be drawn to decoys that look like real birds. Therefore, you want to get a decoy that has feather details that look as real as possible. 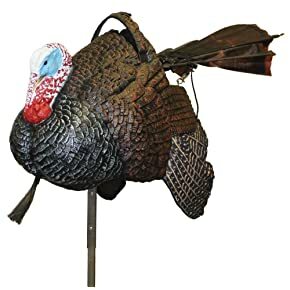 It does not mean that you need to get a decoy that has actual feathers on it, but the artwork should look as realistic as possible. A good turkey decoy will have paint that covers the entire body from top to bottom. The paint should not flake off and it should not fade. The best turkey decoys might even have some textural qualities that make the fake feathers look like they blow in the wind. With a well-designed turkey, you will have real turkeys fighting over the decoy. Good Stakes – The decoy is useless if you cannot get it staked into the ground. A good collapsible stake makes a decoy safe to transport. The stake should be strong enough that the decoy will remain standing even after a real one makes contact. You also want the stake to withstand the weather conditions on the day of your hunt. It is also helpful if the stake allows the decoy to spin, as the movement of the decoy will draw more real birds towards it. The stake should have a pointed tip that allows you to easily place it into the ground in any type of ground. There are several types of decoys available on the market today. Decoys do come in male and female versions of the bird. Male turkeys are territorial and they like to strut, so if you use a male decoy, you will bring in more male turkeys. The real birds will want to show off and out-strut the decoy. So, the best male decoys have full feathers that look like they are ready to get the girls. A Tom decoy can be a little more cumbersome to carry to the field, so some people prefer to get the Jake version. This is the male that will draw in both male Toms who are looking for a fight and females that are attracted to them. There are also hen decoys that work well, too. If you decide to buy a hen, get more than one, because they will travel in packs. The best hen decoys look like they are feeding because real hens will recognize this position as friendly, so they are more likely to approach the decoy. Many hunters will get all three types of decoys so they are ready for any situation. This is one decoy that draws in the real birds. This realistic decoy looks like a breeder hen that is ready to find a mate. The dropped wings and exposed backside brings in the Toms and Jakes who want to mate with this rubbery beauty. She is a part of Avian-X’s LCD (Lifelike Collapsible Decoy) line making her easy to bring to and from the woods. When the boys come to visit, you simply have to wait for them to get in the perfect position so you can aim, fire, and reap the rewards. The bird is made of Avian-X’s Dura-Rubber making her durable, despite being an inflatable decoy, and highly unlikely to crease or dent. She comes with a folding stake so she can move in a realistic way. This two-for-one combo deal is about as good as it gets. The Primo Jake and Hen decoys are lightweight and easy to set up. They look real because Primo uses a high-tech process to craft turkeys that look as real as possible. The two birds are affordable and built to last. They are inflatable, but the bladder is small and difficult to puncture. They come with metal stakes that work with all types of ground. They are covered with a fabric that emulates the motions of real feathers. They are painted with HD paint to truly confuse the real turkeys that are drawn to them. The pair comes with a mesh bag and two stakes. The pair of turkeys can easily be folded up and fit inside of the Jake’s body. They can also be put into a vest for even more convenience. This trio of turkeys is a turkey hunter’s dream come true. When it comes to using decoys, more is better. This set includes three turkeys made of rigid polyethylene foam, so they are lightweight, but not collapsible. The trio includes two Jakes – one aggressive and one passive – and a hen that can be adjusted into a variety of positions. The turkeys look realistic enough to attract real birds. The hen can look like she is eating, breeding, or just looking around for more Jakes and Toms. 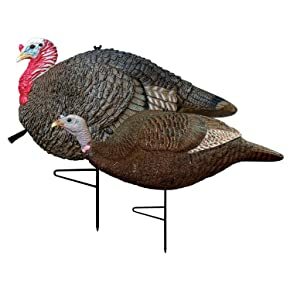 Even though these turkey decoys are not as realistic looking as many other brands, the real birds get very irritated by them and they come running. This silly looking decoy actually works because real turkeys cannot stand it. They want to attack it over and over again. It is one of the least expensive options on the market today, but because it is such a small turkey, the big boys want to beat it up. It has a non-intimidating stance that creates aggressive behavior in Toms and Jakes. It can be quickly folded up and carried anywhere that the turkeys are roaming. The stake and the decoy are easy to transport. Many hunters will buy a few of these to really get the attention of the big gobblers. This decoy is not a cat, despite the name. It is a turkey hen that will help you bag a bunch of turkeys. Miss Purr-fect is a posable decoy that uses Montana’s Perfect Pose Technology. You can pose her to look like she is feeding, looking, or breeding. No matter what pose you put her in, you have a good chance of having her bring in the boys – especially if you have a few Miss Purr-fect Decoys in your collection. This decoy is easy to carry because it compresses into a small size. The decoy comes in a realistic size and has fabric feathers that react to weather conditions. The decoy offers options for the leg pole, so you can have her laying down or upright. Her neck is movable, too. When it comes to realistic decoys, this one is about as good as it gets. The Shake-N-Jake Decoy has a remote control that works from a distance of 150 feet. The decoy’s movement mimics the movements of real turkeys, especially the Jakes. The remote allows the user to make the body turn and to make the tail go up and down. The turkey and remote use four AA batteries. The turkey stands on a two-foot tall stake that fits inside of the turkey for easy storage. The turkey itself fits into an orange carrying bag which lets you safely transport the turkey to your favorite spot in the woods. There are several brands that are popular with turkey hunters. Avian-X is one brand that is constantly looking for ways to make turkey decoys more realistic. Their decoys are durable, lightweight, and highly effective. Montana Decoy has been building decoys for all types of hunters who appreciate their dedication to the sport. The company has been in business for 20 years, proving that they are here to stay. MoJo Outdoors is a decoy company dedicated to making waterfowl products. They have a TV show that provides hunting resources and their products are uniquely modern. This video will show you the best way to set up and stalk turkeys with your decoys. When you pair the best turkey decoy with a turkey call, you will get plenty of birds coming your way. With the right tools, it is easy to have a highly successful turkey hunt. Turkey hunting becomes easier when you use a realistic turkey decoy. Since they come in a variety of prices and sizes, there is a perfect decoy for every hunter. If you have any questions about other tips and tricks to make your turkey hunting expeditions more successful, check out Roam Outdoor’s suggestions. With a new turkey decoy and a few extra tips, your hunting will go to the next level. If you have any suggestions or questions about turkey hunting, please share in the space below. How far will you set the decoy from the turkey? The bigger the turkey decoy is, the better since it would be more visible to the targets. It should also look realistic and should be able to perform a few movements so that it would believable. You have stated a lot of good points. a shout out from Humble Tx! Just wanted to tell you keep up the fantastic job!